Two weeks of thrilling wildlife encounters, stunning scenery and cheerful companionship, this safari will really open your eyes to all that Botswana has to offer. From the sweeping grassland and huge skies of Nxai Pan to the watery wilderness of the Okavango Delta, from the elephant-filled Chobe River to the thundering majesty Victoria Falls, it’s highlight upon highlight. This semi-participation safari is a real adventure and excellent value for money, truly a winning combination. Day 3: It’s an early start this morning as your route will cover some 500 kilometres, travelling south to Nxai Pan National Park. 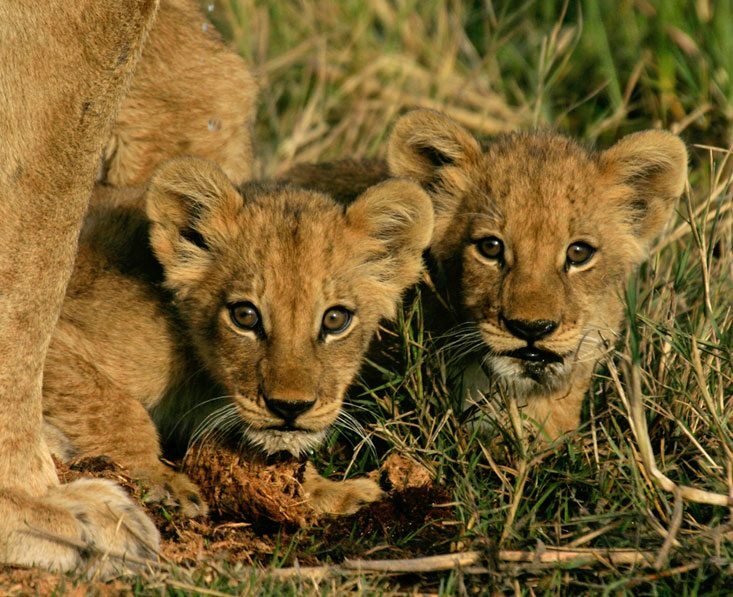 There will be about 6 hours of driving today, but on the way you’ll stop for a wholesome picnic lunch followed by an afternoon game drive in the park. 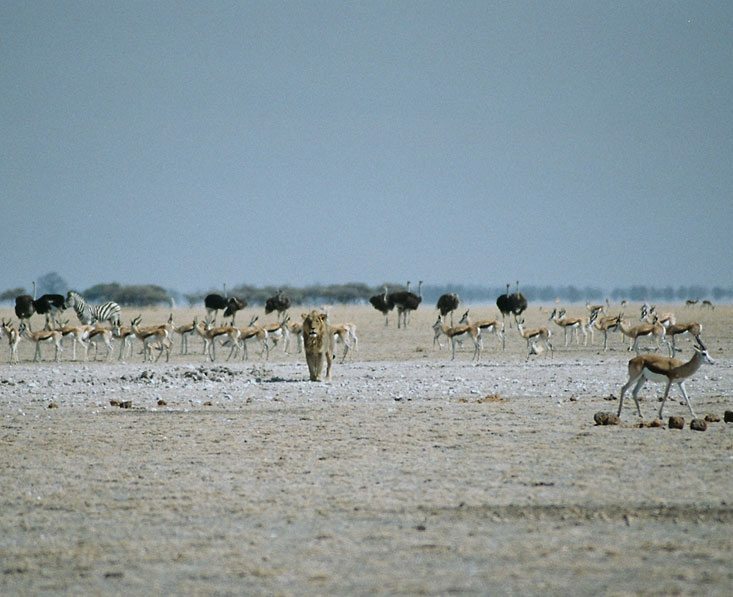 The landscape is dominated by sweeping grasslands with glades of acacia trees and is home to a surprising range of animals. Reaching your campsite you’ll help put up your tent, later enjoying a shower and sitting down to a delicious dinner. (Full board). 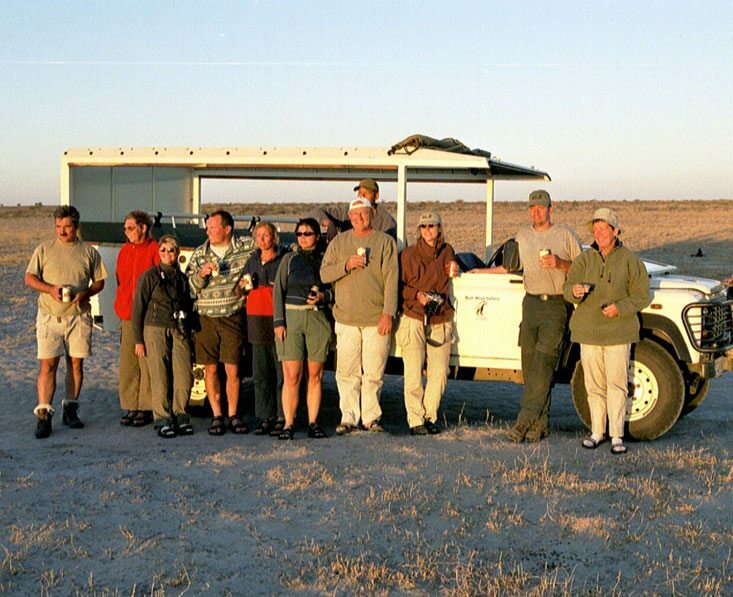 Today you will explore Nxai Pan and the plains which are often dotted with grazing herds of impala, kudu and springbok. You can also expect to see giraffe, zebra, ostrich and lion. 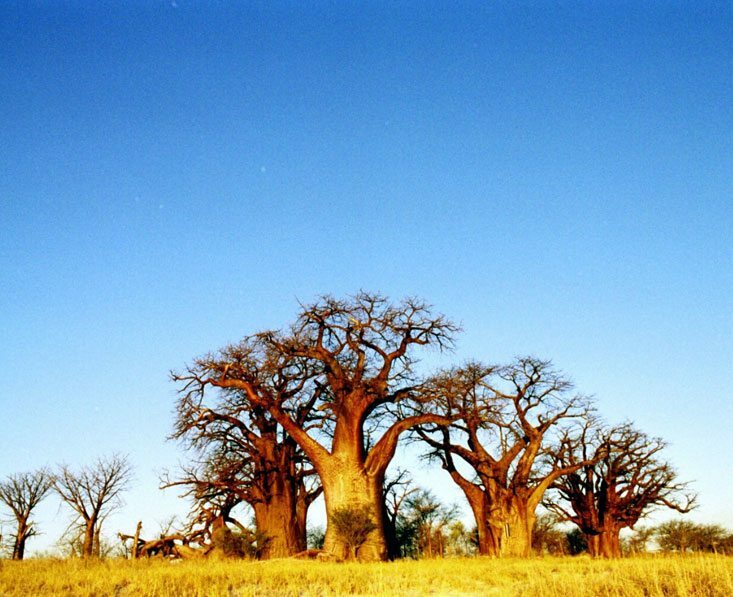 In the afternoon you’ll have an excursion to Baines Baobabs, seven huge trees situated on the edge of an expansive saltpan. They’re named after the 19th century explorer Thomas Baines who, struck by the sight, was moved to immortalise them in paint. The scene remains unchanged today and you’ll share his sense of wonder as you gaze on them. (Full board). 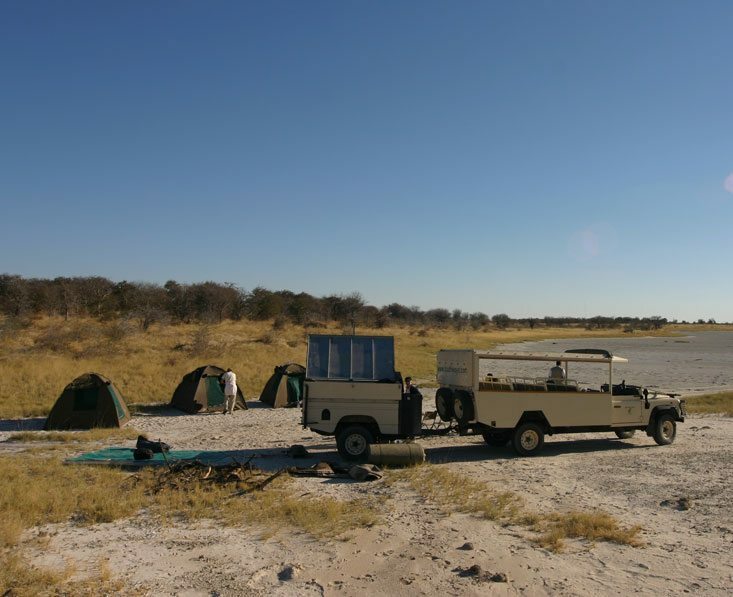 Day 5: After enjoying a morning game drive, your 3-4 hour journey continues to Maun, the gateway to the Okavango Delta. In Maun you will have time to visit the shops and enjoy a relaxing afternoon or you could choose to enjoy a 45 minute scenic flight over the delta (payable locally in cash) for a fascinating bird’s eye view of the delta. Whatever you choose, you will have time to stock up on drinks and snacks. You’ll have one night at the campsite here. (Full board). 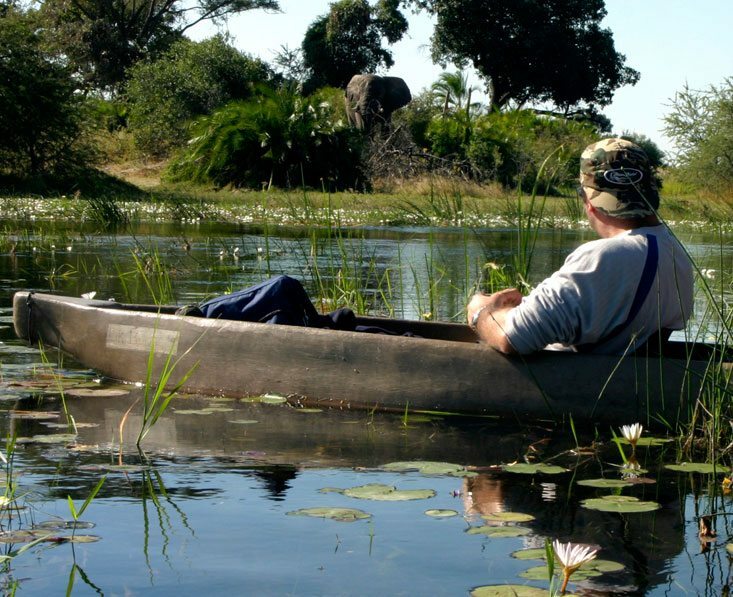 Today you’ll travel about 2 hours to the southern tip of the Okavango Delta, where you’ll meet your poler, leave your main luggage in the trailer, and climb aboard a mokoro, a traditional dugout canoe, for your island adventure. This area really is a little corner of beautiful and peaceful paradise. You’ll get time to look out for the varied birdlife of the region and enjoy the beautiful landscape. This is the quintessential delta experience – sit back and enjoy the ride to your camp! (Full board). You’ll spend a full day enjoying guided walks on the islands and mokoro excursions on the waterways. Your guide will lead you on these discoveries, helping you spot wildlife and explaining the intricacies of ecosystem of the largest inland delta in the world. It’s a magical place and you’re sure to fall under its spell. Back in camp you can review the day’s highlights with your friends, sitting by the camp fire. (Full board). Day 8: Today you will start to make your way to the drier region of the delta and you will see how the landscapes change. Your journey today will be about 2 hours. Your home for the night will be a camp just outside of the Moremi Game Reserve, ready for the next exciting chapter of your trip. (Full board). 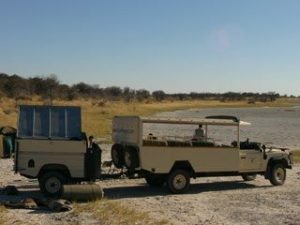 Days 9 & 10: After breakfast your adventure continues, heading to Moremi Game Reserve, one of the best wilderness areas of Botswana encompassing swamp and dry areas. This is widely regarded as one of the most beautiful reserves not just in Botswana but in the whole of Africa. You’ll spend the afternoon and tomorrow in the western/Xakanaxa area viewing the wide variety of animals and birds for which this area is known, including the Big 5. The habitats are equally beguiling, a rich mix of lagoons, waterways, pans, grasslands and forests. (Full board). There’s so much to see in Moremi that today we’ll move camp to the north-east/Khwai region of the reserve for a change of scene. 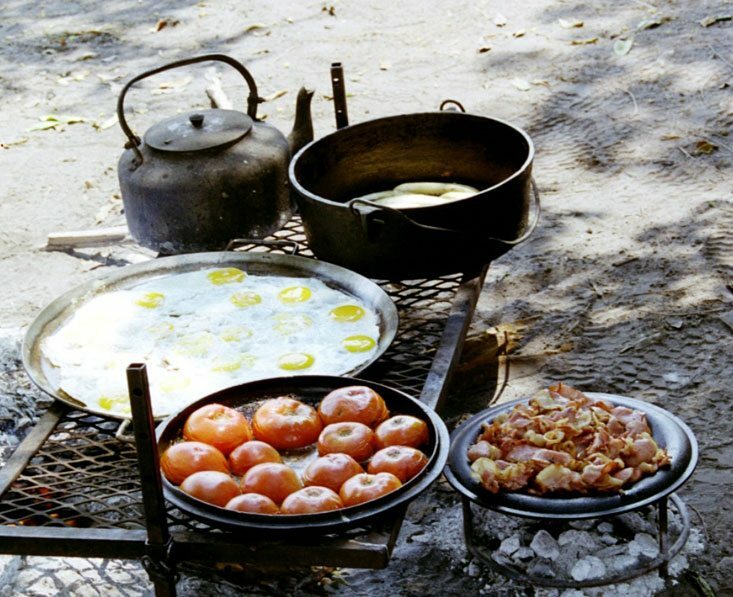 You’ll set off on a game drive early each morning, returning to the camp to sit out the heat of the day, savour lunch and rest. 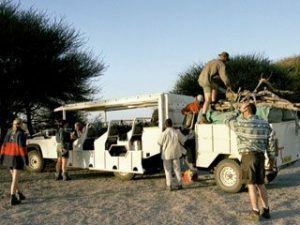 The second game drive takes place in the late afternoon. Both are timed to take place when animals are at their most active. 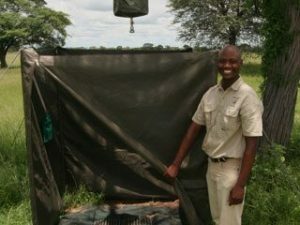 This, coupled with the skill and experience of your guide, will optimise your chances of top quality wildlife sightings. (Full board). 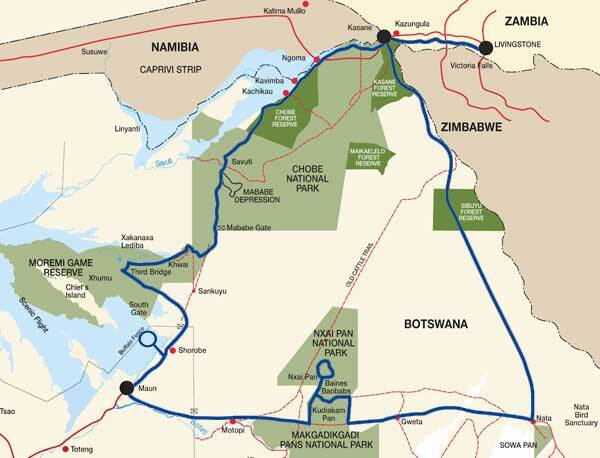 Day 12: Today you’ll head north towards Savuti in the south of Chobe National Park. It’s a journey of about 7-8 hours including plenty of chances for game viewing en-route. The area is home to various antelope, elephant, giraffe and zebra. 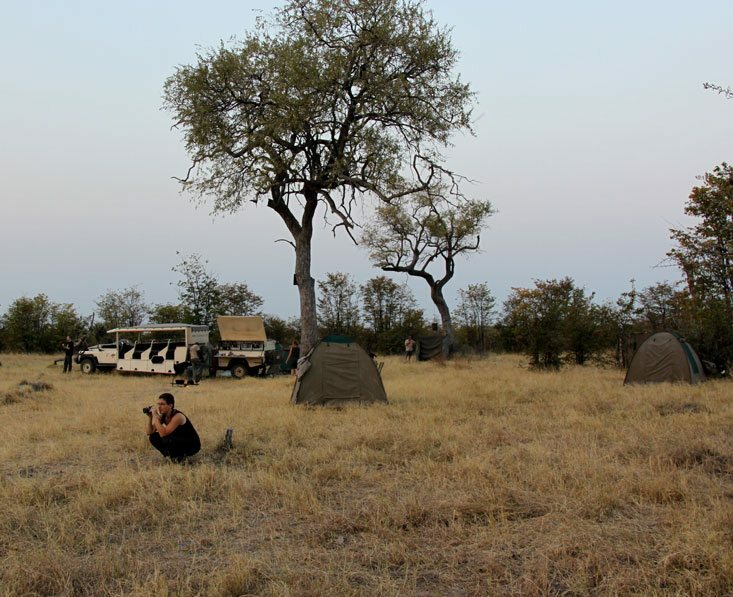 By late afternoon you’ll reach camp and a chance to stretch your legs and take in your new surroundings. (Full board). Continuing northwards you’ll head to the Chobe river floodplain. This is another opportunity to look for wildlife and enjoy the superb vistas as you travel. The terrain incorporates mopane forest, marshes and dry scrubland, and the animal and bird life is prolific. Keep your camera at the ready to capture memorable wildlife and scenery photos. After 5-6 hours you’ll arrive at camp where you spend 2 nights. (Full board). Day 14: You’ll have a full day in Chobe. 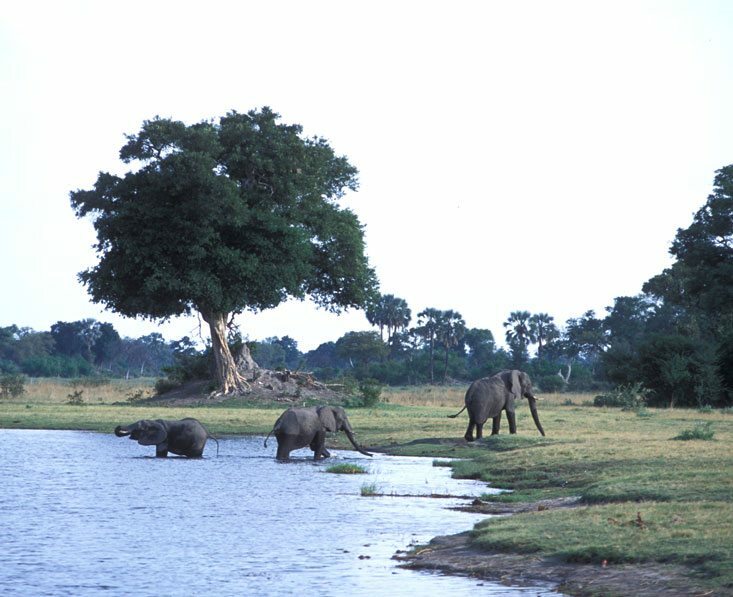 The park is associated with large herds of elephants (especially in the dry season, and particularly August to October) and you should certainly see plenty of these splendid creatures today. 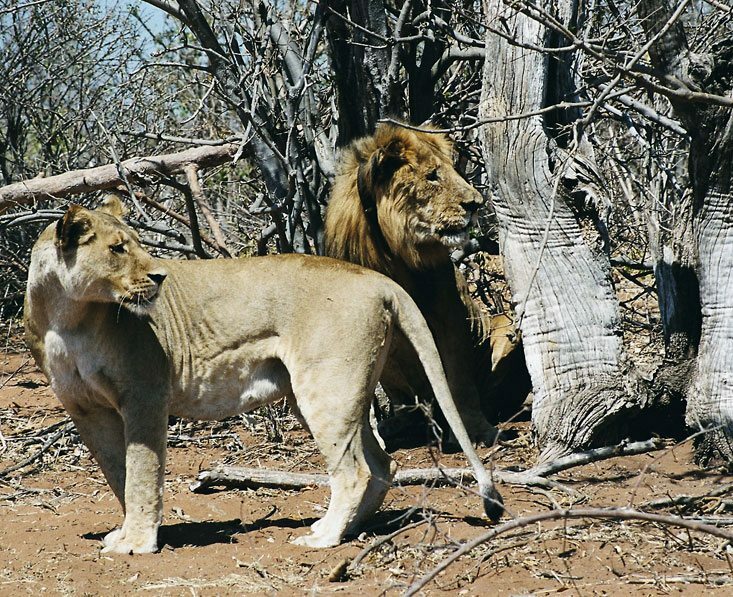 Buffalo, waterbuck, puku and giraffe thrive here too, and they attract predators such as lion, leopard and hyena. Spending time here will give an insight into the interaction of these animals and their environment. After a busy day you’ll welcome dinner by the fire. (Full board). Day 16: After breakfast, and maybe a quick swim in the pool, you’ll be driven the short distance to the airport for your flight home. Bear in mind that we can always add on more days here if you’d like to take it easy, or enjoy yet more of the activities and sights in this area. (Breakfast). This trip starts in Kasane and ends in Victoria Falls. From the UK, we recommend getting a flight with a combination of British Airways, Air Botswana and/or South African Airways via Johannesburg. This trip can be done in reverse. A rough price guide per person would be £900 – £1400 in economy depending on the season. This is a small group set departure safari. 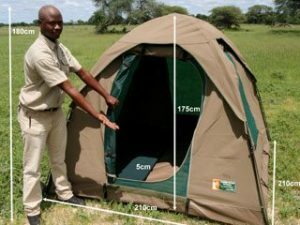 2 night guest house/lodge accommodation (The Old House in Kasane and Nguni Lodge in Victoria Falls), 13 nights camping (bow tents with mattresses), all transfers, meals as indicated, teas/coffees on safari, services of a professional safari guide and camp assistant, specially adapted safari vehicle, park and concession fees. Visas, international flights, vaccinations, drinks, meals not listed, sleeping bag & pillow (can be hired), Vic Falls entry fees, optional activities, travel insurance, items of a personal nature.